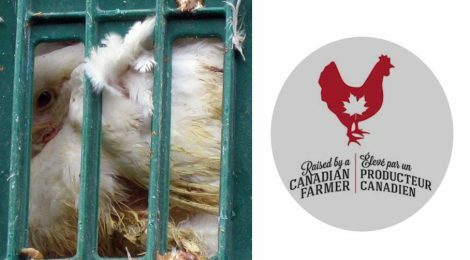 Hoping to tap into the belief that local equals better, the chicken producers of Canada launched a new sticker campaign called “Raised by a Canadian Farmer”. 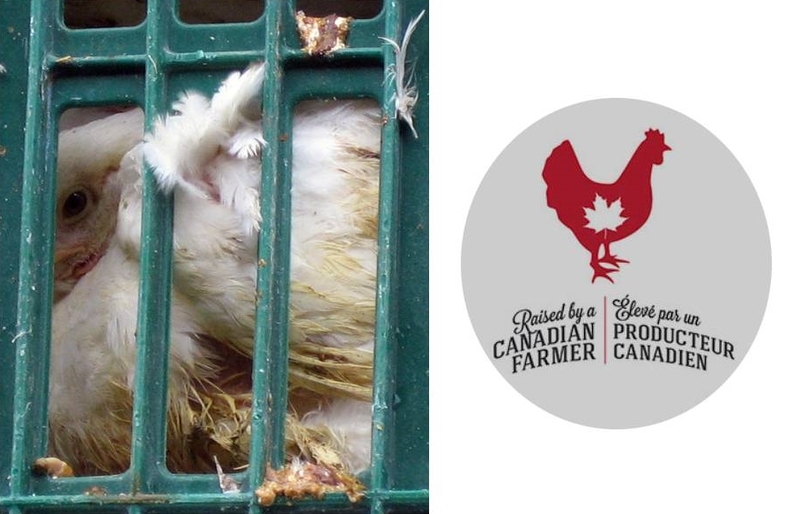 The sticker claims to help Canadian consumers “make informed buying decisions about where their chicken comes from and how it’s raised”. The chicken producers state that chicken meat bearing this label assures Canadians that the birds were raised according to rigorous standards. What they don’t mention is that those standards are based on a code of practice that was developed 12 years ago, is outdated according to current science, isn’t enforced, and allows chickens to, among other things, be de-beaked without painkillers and crammed into battery cages for their entire lives. Consumers looking to buy local often do so because they believe animals raised for food in Canada are raised according to superior welfare standards. Sadly, this is not the case. While Canada may have some animal welfare laws, farmed animals and practices deemed “standard” are exempt. Standard practices include mutilations by unskilled workers without painkillers, intensive confinement, and use of slaughter methods with high failure-to-stun rates. In the case of chicken slaughter, the primary method used in Canada – the electrified stun bath – is so notoriously ineffective that more progressive countries have put strict rules in place regulating the voltage required to actually stun the birds. The problem is the voltage is so high that it causes blood spots on the meat, devaluing it and making it uneconomical to use. Because of this, all poultry slaughterhouses in The Netherlands have completely stopped using the electrified stun bath. As long as animals continue to be seen as property in the eyes of the legal system, and enforcement remains ignored, “Made by a Canadian Farmer” will remain meaningless and misleading.